It's hard to believe, but it is already the end of the year. You're likely well underway in planning how you'll meet your company's goals in 2019. If you haven't yet, then hopefully it's on the checklist for the next week or two! For sales, this means setting monthly bookings goals (not to be mistaken for billings or revenue goals, which is a common confusion) as well as monthly sales representative quotas and compensation plans. 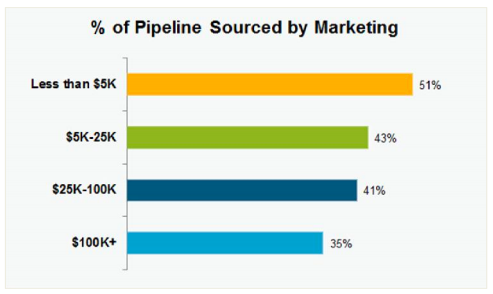 For marketing, this means forecasting marketing's contribution to the pipeline and the number of opportunities that will need to be sourced and bookings generated. Building out sales models to forecast the next 12 months is no easy task, and you'll likely need to make some assumptions along the way. With that in mind, here are four critical levers that are often overlooked at the expense of understanding exactly what it will take to, a year from now, be looking back on just how successful you've been at hitting your goals. No matter how great your sales team is, everyone is human. Even your all-star representatives probably aren't going to hit their quotas every single month. Because of this, we must introduce this variable to our sales planning models if we're going to staff and forecast correctly. The only question is, what is a realistic quota-attainment benchmark? 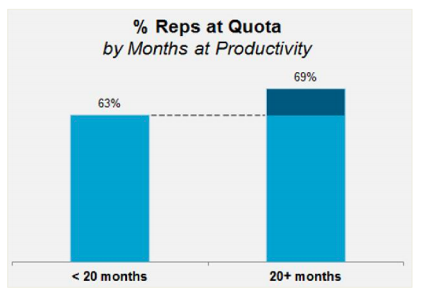 The Bridge Group has studied the performance of inside sales teams and found that in fact only 67 percent of sales team members hit their quotas on a monthly basis! By introducing this variable into the sales planning model you can then multiply each monthly target by the 67 percent. This means that a fully ramped sales rep with a $50,000-per-month target will in fact only book $33,500. It's unrealistic to expect new sales reps, no matter their level of previous experience, to be fully productive right immediately upon joining your team. They'll need time to come up to speed on your specific product/solution and sales process. So again, if you don't introduce a variable to account for this slower increase in productivity, you'll be setting the business and your sales team up for failure. 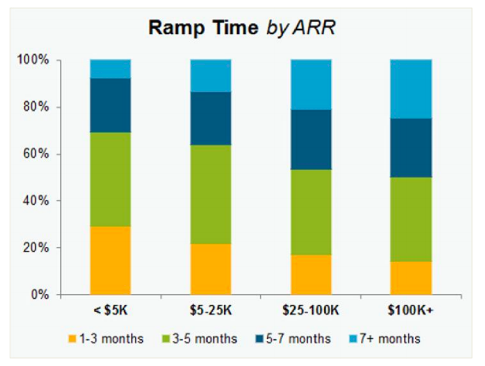 Turning again to data from the Bridge Group, it shows that ramp times can last anywhere from three to seven months, depending on contract size (measured here as annual recurring revenue). With these two assumptions accounted for, you should be able to set realistic bookings goals, while accurately defining the resources and number of FTEs the sales team will need and hedge risk. The final variable that should be introduced into your sales team's performance is employee attrition. 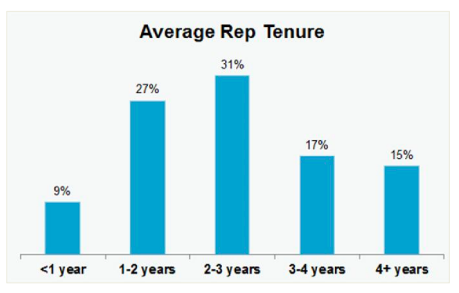 The Bridge Group shows us that average rep tenure is 2.5 years, though this is something you should be also tracking for your own business. Now you can add this number back into your bookings goals to help create a more accurate monthly bookings plan and hiring roadmap. Armed with a better understanding of just how many opportunities and pipeline coverage you'll need, it's time to turn your attention to where these opportunities will be sourced. 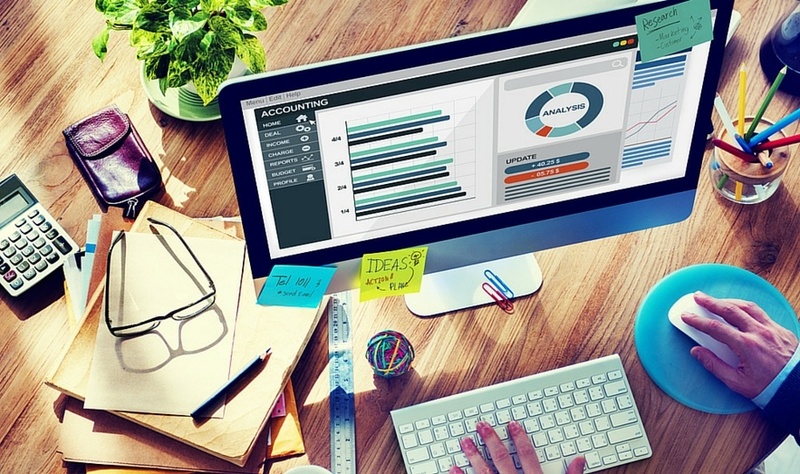 What percentage can marketing contribute? What percentage will be sourced by outbound sales, customer referrals, or other additional revenue streams? Each tier then influences not only the marketing budget, but also the leads sourced by marketing and influenced by marketing. These exercises will allow you to forecast your sales and marketing growth much more accurately, defining hiring and capacity, rep management, quota attainment, marketing goals and budget. If you're looking for additional resources, I highly recommend looking at this Sales Team Planning Template from InsightSquared, the Bridge Group's Inside Sales Report, and our Guide to Inbound Sales.